AMD have released an important new driver for their AMD Radeon Pro GPUs in October 2018. This release is fixing many major issues that AMD had with Citrix Virtual Apps & Desktops (aka XenDesktop), I am very happy to see that the engineers inside AMD worked hard and now everything is working out of the box and no “tweak” have to be done to get it working. The drivers works both with a physically machine with Radeon Pro + Citrix Virtual Apps & Desktops (aka XenDesktop) or with a Virtual machine where the AMD Radeon Pro GPU are attached as GPU passthrough or sliced via SR-IOV with S7150/S7150x2 with Citrix Virtual Apps & Desktops (aka XenDesktop). I have tested the drivers in my lab with AMD Radeon Pro WX4100 + S7150 and S7150x2 and I can confirm that AMD have fixed below, which is important. I haven’t tested with VMware Horizon yet. Lets Dig in why this is important. Locked Clock Speed with AMD Radeon™ Pro WX 7100 may be seen. Dassault Systèmes® Solidworks® 2018 may crash at Customer Site while applying service metal fabrications. “19.Light.vpb” file may show issues while rendering with Autodesk® VRED. Application launching issues with Siemens NX™ 12.0.2 may be observed. Some Viewport Corruption may be seen with Blender®. Some issues may be observed with SPECapc™ Solidworks® 2015. Solid Color Outputting may be seen on display using Specific DP 1.2 to HDMI 2.0 Dongle. Dassault Systèmes® Solidworks® 2018/2017 may stop responding after rotating or changing display style on Windows® 7. DXGI window mode stereo in Stereo 3D may only show left eye image when enabling active/passive stereo in Radeon™ Pro Settings on Windows® 10 RS4. Application may stop responding while using ‘sliced geometry’ feature in Notch. Corruption may be seen on model with change in Anti-aliasing modes with Dassault ICEM Surf™. Display issues may be observed while running Nuke benchmark on AMD FirePro™ W8100 and AMD FirePro™ W9100. Unexpected behaviour may be observed when running Intergraph SmartPlant FreeView on AMD FirePro™ 7150 with Citrix® XenDesktop®. Toggling between full screen and windowed mode on Citrix® XenDesktop® may lead to temporary viewport corruption. On Windows® 7, a Catalyst Control Center error may be observed when resizing Citrix® XenDesktop® window. NVIDIA have released new drivers for NVIDIA GRID 5.2 for January 2018. Its time to update your NVIDIA TESLA M6, M10, M60 environment or start using the new TESLA P4, P6, P40, P100 with GRID 5.0. 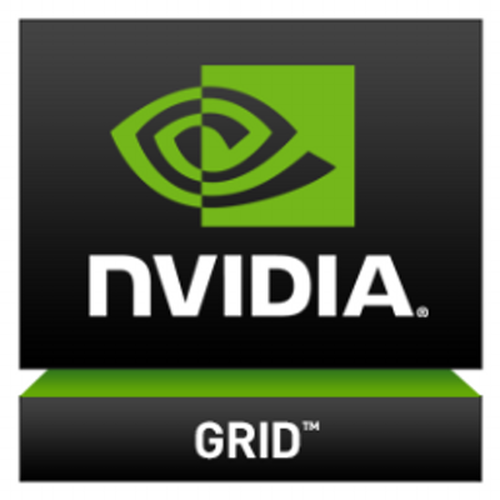 NVIDIA have released new drivers for NVIDIA GRID 5.0 for September 2017. Its time to update your NVIDIA GRID K1, K2, M10, M6, M60 environment. NVIDIA have released new drivers for NVIDIA GRID 4.2 for March 2017. One of the great things about adding a GPU in a Citrix XenApp environment is that you can allow rich graphics and offload CPU and run your DirectX, OpenGL applications on a XenApp server. In latest version of Mozilla Firefox WebGL, Direct2D, DirectWrite this have been disabled, so you can’t open webpages that uses these graphics in a Citrix XenApp session. this will not load anymore cause WebGL is default now disabled in Mozilla Firefox. Mozilla Firefox 40.x blocks GPU acceleration for WebGL, Direct2D, DirectWrite in remote sessions on Windows Server operating systems. Direct2D Enabled Blocked for your graphics card because of unresolved driver issues. WebGL Renderer Blocked for your graphics card because of unresolved driver issues. The text “Blocked for your graphics card” is misleading as, in this case, it is not the specific graphics card but general Windows Server operating system remote sessions that are blocked. 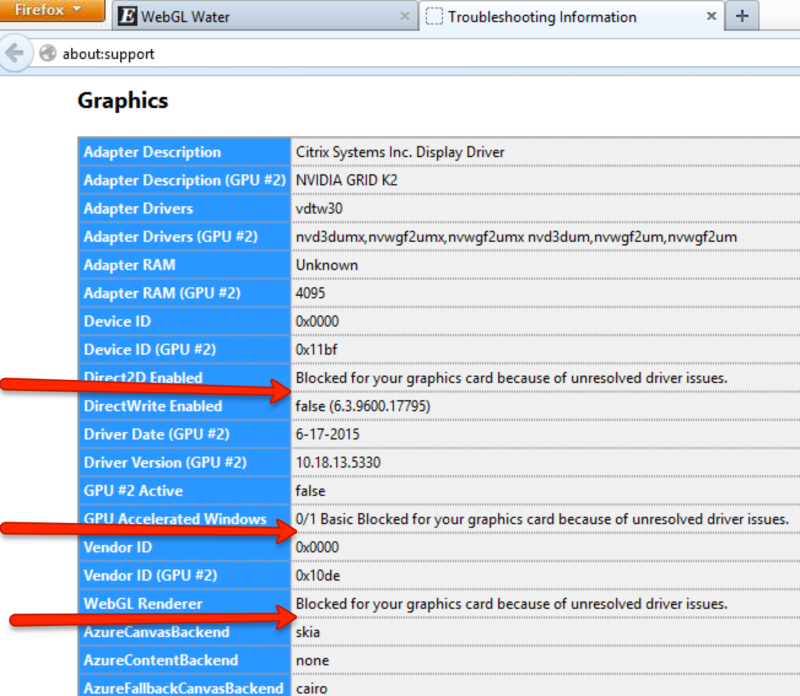 Mozilla’s published advice on how to override the graphics driver blocks also applies to XenApp sessions on workstation operating system (see bottom of this Mozilla Wiki – Blocklisting/Blocked Graphics Drivers). You can double click on it and then it will become enabled. (with the value=true) and this is user set. These settings can be change with a policy or with profile management such as RES Workspace Manager or others. This issue only affects server operating system (example – Win 2012 R2 and Win 2008 R2) and XenApp. If you would like to forcibly enable a graphics feature that is blocked on your system, follow these instructions. Warning: do this at your own risk. There usually are good reasons why features are blocked. To force-enable WebGL, go to about:config and set webgl.force-enabled=true. To force-enable WebGL anti-aliasing, go to about:config and set webgl.msaa-force=true. To force-enable Layers Acceleration, go to about:config and set layers.acceleration.force-enabled=true. On Windows Vista and Windows 7, to force-enable Direct2D Content Acceleration, go to about:config and set gfx.direct2d.force-enabled=true. On Android, to force-enable StageFright software decoding, go to about:config and set stagefright.force-enabled=true. Click the Firefox button, then select Help, finally Troubleshooting Information and check the Graphics section. If force-enabling a feature doesn’t work, that probably means that your hardware doesn’t support it. For example, layers acceleration currently requires support for 4Kx4K textures, which rules out some graphics cards, like the Intel G31/G33. Another great blogpost to read about this subject is my friend / CTP fellow Barry Schiffer http://www.barryschiffer.com/citrix-hdx-3d-pro-and-nvidia-grid-browser-experience/ He was the guy who wrote a great blogpost with some very interesting results on performance tuning Mozilla Firefox in a XenApp/XenDesktop session.